Rail crossing at 7th and Jackson in Japantown. If you’re a bike commuter, one of the most dangerous parts of your ride is probably that rail crossing. The one with broken pavement and giant potholes all around it and a Himalaya range of mounded up pavement running along each rail. To cross this track without landing on your face, you’ve got to pick your path carefully, and that might mean swerving out into the traffic lane to cross at a relatively flat spot. In my case, that rail crossing is at the corner of 7th and Jackson Streets, just on the east edge of Japantown. Getting to my old job, it was on 10th Street, just north of Hedding. There’s probably a few crossings just as bad scattered around other parts of town too. For years, whenever I mention these problem crossings to city staffers, they’ve told me they rely on Union Pacific railroad to maintain railroad crossings, and there’s little they can do to get them fixed. But just this week, I had a chance to mention that crossing again to a group of city transportation engineering managers, and I learned something new. Jay Thorstensen from the Transportation department emailed me a day later and let me know its possible to contact UP directly to let them know about dangerous track crossings. Contact details are found on the UP website. 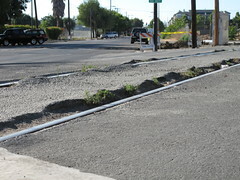 Basically, for non-emergency track or crossing maintenance issues in California, the number is (916) 789-6114. That gets through to a real person, though its not clear how quickly he can actually respond to problems. I’m hoping at least that enough calls about a particularly problematic crossing can move it to the top of the list for repairs.